W hat is the Stump Drinking Game? The Stump Drinking Game will take your next outdoor drinking game day to the next level. Obviously, this game is for people that like throwing hammers, drinking, and getting nailed. The goal of the Stump Drinking Game is to flip a hammer in and the air, catch it, and drive your opponents nail into a tree stump. If your nail gets hit, you take a drink. As a, now, mature adult I must say that this is one of the dumbest and more dangerous games we have on Backyard Games. However, once you get past the obvious concerns, I was lucky enough to have played this game about a dozen times with friends with no serious injuries. This is where I should include a disclaimer that you should not play this fun game while consuming alcohol and we are not responsible for any injuries or claims. Now that all the legal stuff is out of the way, time to teach you how to play the Stump Drinking Game! One person needs to be designed to prepare the Stump, so it is ready to play. This person receives the title “Woodmaster”. The woodmaster will hammer the nails on the top of the stump for each player. The nail needs to be sturdy and straight, but hammered in as little as possible. Make sure that the nails are spread out evenly around the outer area of the stump. Once all the nails are setup on the stump it is time to claim your nail by standing by it and putting your foot up to the stump. Some people may play in teams, but we typically just play individuals while ganging up on someone. Once you have chosen your nail you draw numbers or any game of chance to see who starts off first and go around the circle clockwise. One of the first rules of Stump, as you will see below, is that you must have a beer in a hand at all times. For each round, you will need to make sure that it is a full beer and common practice to open it with your hammer. It works great for fancy beers aka non-twist off imports. When it is your turn with the hammer, you must earn your wings by flipping the hammer and catching it by the bottom grip. The hammer must do at least one full 360-degree rotation before catching it. If you do not catch it by this grip, then you lose your turn and must take a drink. You can get more swings if you are able to flip your hammer more then once with what is called a multiplier flip. For every flip you do, the additional swing you get to knock more nails. Be careful because if you miss to attempt one of the additional tricks you must drink for the number you were trying for. 1 x Flip: Flip the hammer once and catch it by the grip. 2 x Flip: Flip the hammer under your leg and catch it by the grip. 3x Flip: Flip the hammer behind your back and catch in front of you by the grip. 4x Flip: Flip the hammer behind your back and over your head catching it by the grip in front of you. This has caused a few bumps on the head and sore morning. The objective of the game by catching the hammer on the flip is to make it make it difficult to aim. The swing is meant to be done in one steady motion. In doing so the harder you swing, and more force may ensure you drive the nail into the stump with one shot. Any attempt at aiming the hammer is disallowed and subject to harsh criticism. The goal is to be the last nail standing to win. It is one of the few games I have played where our goals were not to get nailed. If you drop the hammer or not catch it by the grip, then you take a drink. Swinging and missing a nail means take a drink. There are several different ways you can play this. To make things easy, we like to say 1 drink per flip. This means if they hit they hit your hammer after doing a flip behind their back for example, drink by the multiplier of 2,3,4. Another way is to drink proportionate to how far you were nailed in. Assuming you must finish an entire beer by the end of the game, if they knock it half way then drink half your beer. However, at any time if someone drives you nail in with the first show you must slam all your drink. If any players create spark from the hammer hitting the nail, everyone must take a sip of their beer and yell sparks. If a player drops the hammer at any time, take 1 drink. If a player puts down their drink at any time without permission, take 1 drink. At any point, if your nail is hit and bends over to interfere with the point, you may fix your nail but it will cost you 1 sip. Out of sportsmanship offer if anyone else needs theirs fixed at no cost to their own. Still confused about what the heck this game actually is? 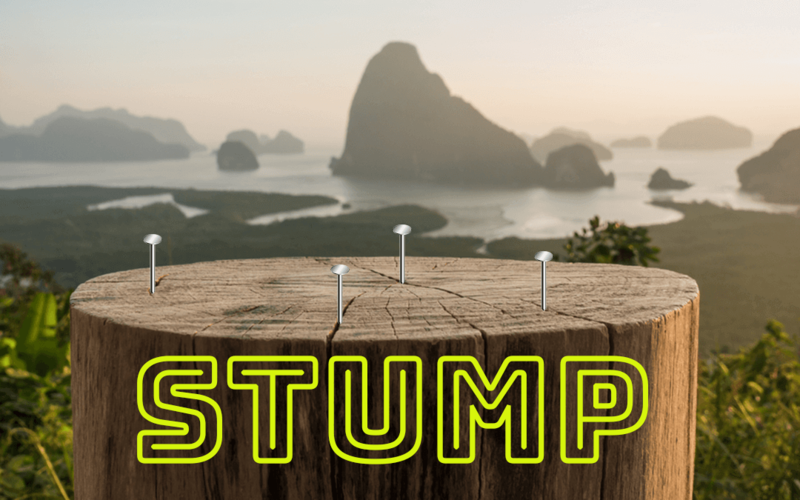 Here’s a failed kickstarter for a portable stump. It is however a good how-to visual instructional. For everyone who has got this far and still wants to play this game you will most likely love it. I went to a tailgate party once and this game was a pretty big hit of the entire event. It is a game that can be played with even 8 or more people and is all about fun. Use discretion on the trick shots and make sure to be careful. Live long and Stump On!! !